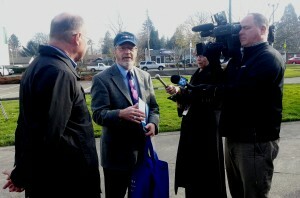 TriMet General Manager Neil McFarlane (left) honors Jonathan Harker (center) with a TriMet “world record” for MAX ridership. 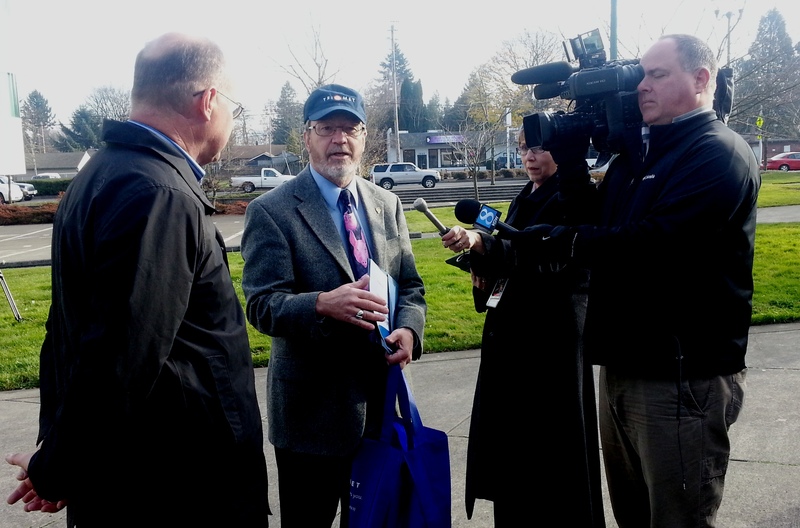 Gresham Urban Design and Planning Director Jonathan Harker retires on Friday, Nov. 29 with what TriMet is marking as a world record. Harker has spent more than 26 years commuting by MAX, logging some 12,700 trips between work and home. We believe he is the longest-tenured commuter in the history of MAX! …all spent commuting on the MAX. We think that’s worthy of a “world record” so on Wednesday, Nov. 27, TriMet’s General Manager Neil McFarlane bestowed the title on Harker. Had Harker chosen a car over MAX, he would have driven more than 161,000 miles. “By choosing transit, Jonathan reduced congestion on Interstate 84, made our air a little cleaner, saved more than 120,900 pounds CO2, and in the process no doubt read more than a few books, checked his email and met thousands of interesting people,” said McFarlane. The MAX Blue Line, TriMet’s busiest and oldest light rail line, provides more than 64,000 weekday rides. It opened in September 1986, known as the Eastside MAX Line, and was one of only three light rail systems in the country at the time. Learn more about the MAX Blue Line history. TriMet’s online trip planner and our mobile ticket app make it easy to ride! You can plan a trip with information on travel and walk times, transfers and cost by using the trip planner at trimet.org, or m.trimet.org for smartphones. Our TriMet Tickets mobile app lets you easily purchase and use tickets and passes instantly on your phone – anywhere, anytime. Just download the free app, register your debit/credit card in our secure system and you’re ready to buy, activate and go. Learn more at trimet.org/mobiletickets.